A few weeks ago I was thinking about what I wanted to offer my students. How could I give them skills that will assist them in becoming successful in the future? What is it that makes people stand out from the crowd? Then I found my orange pair of shoes. They were perfect. They stood out from the plain, stock- standard, white shoes. To me the white shoes represent students who can tick the right boxes, the ones who know that for a question that looks like A, I need to give a response that has a well-developed character description and setting, or if it happens to look like B, begin with a strong introduction, followed by three convincing reasons, all with supporting details. Or worse still, colour the circle. Creativity is what makes employees stand out in the competitive world and as a teacher it is my number one goal to instil real-world, creative, problem solving into the classroom... Challenge-Based Learning perhaps? Looking forward to using the 'Words Their Way' Spelling program this semester. 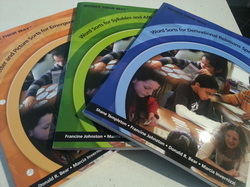 3 of my books have arrived in the mail and I have begun creating my resources which you can check out HERE. You will find links to the inventories and my organisational materials. Soon I will add a link to our Spelling timetable and student contracts which will utilise technology in as many ways possible. I'm thinking Quizlet for flashcards, Spelling City for practice, Keynote for definitions/ sentences/ pictures and Scratch for the creation of linked spelling games. I may have to checkout Pintrest for some other fabulous suggestions! I have used Edmodo in the classroom for two years now and find it has many educational benefits. having teachers are at the center of a powerful network that connects them to students, administrators, and parents. providing the best resources and tools, providing the building blocks of a high quality education. providing a secure environment, where teachers and students can collaborate, share content, and use educational apps to augment in-classroom learning. enable teachers to personalize learning for every student. For me, Edmodo is an engaging tool that allows teachers and students to access and explore content, engage in discussions, share ideas, and practice netiquette in a secure environment and to top it off, I find it a great organisational tool. I am fortunate that my classroom is what I would call 'technology heaven'. My students either own or have access to, Macbooks for every minute of the class day, we have a Promethean Smart board and an Apple T.V. Students are increasingly engaging with digital technologies, both inside and out of the classroom and I feel as an educator and parent that educating children to be digitally literate and social media savvy, should be a priority. Prior to using Edmodo in the classroom, our class spent time engaging with Landsdale Primary School's iPromise policy which outlines the characteristics that good digital citizens exemplify. We also spent time exploring Cyber Safety topics and identifying ways students could be 'Cyber Smart'. How does this connect to using a social networking site such as Edmodo in the classroom? Teacher guided, scaffolded and supported practice. I created a teacher account on Edmodo (www.edmodo.com) and added my class account. Prior to students having access to their accounts, discussions were held on topics such as positive comments and educational content. As days passed spamming had to be addressed, as 20 comments with 'hello' written on 20 different links made it frustrating for students to find information they needed. This is exactly what I am talking about. It happened, nothing is secret on Edmodo, there is no private commenting between students, we are able to discuss what makes a good comment and what equates to 'spam' in context. In the same regard, students have had, training on how to respond with positive comments, why USING CAPITALS can be seen as agressive and why, even though I am a stickler for proper punctuation, it is okay on Edmodo to add a smiley face to assist in creating a positive comment :D We have been able to discuss the use of different types of language for different purposes. How you may respond differently to another student as opposed to a teacher or Principal. I think I've made my point, social media netiquette can get you into all sorts of trouble and it is important to be explicitly taught the niceties of online social contact. Edmodo creates opportunities for discussions about Cyber Safety and what content is appropriate to post and what is not. Students who have been taught all of the do's and don'ts of Cyber Safety can and will make mistakes. With Edmodo, the class site is private and if students accidentally post something about themselves, for example an address or phone number they have 32 moderators to explain why that is probably not a good idea and I am able to delete it immediately if I come across it first. Classroom organisation is assisted by the use of Edmodo in the classroom. I would love to say that I have a paperless classroom, and come back in a year and I may have mastered this, however for the moment I can't say paperless- just less paper. I have a portable scanner in my class and also a scanner on my phone. After a piece of text or handout has been scanned, I am able to attach a file, website address or interactive link to my comments on Edmodo. This allows students to have easy access to lesson content, without having to distribute handouts, type in excessively long URLS, or inefficiently search for interactives or videos. The ability to create quizzes and polls are great features of the website. Once you input the quiz content students are notified that they have a quiz, complete it online and then, here is the best bit...Edmodo marks it and puts the results in an online grade book! The polls are a great way for students to share valuable information about their thoughts, feelings, understandings and ideas. It is quick, Edmodo tallies the results and the students love not only taking the polls, but also assisting me when creating them. I have the Edmodo App on my phone. This notifies me when a student posts a comment, asks me a question, completes a quiz or poll. We have a cut off time for Edmodo access- 8 pm. No comments after this time. I know for many teachers, it may seem overwhelming or undesirable for students to have access to you outside of school hours, this is a personal choice. Initially students want to contact you for every question about homework, projects and news updates, however this soon wears off and students begin asking each other the questions and assisting each other with homework and projects. I do not mind one bit students messaging me on Edmodo. Sometimes all it takes is one comment from the teacher to clarify a concept or respond to a question to put a student's mind at ease. In addition, I send links to educational websites, I ask questions relating to topics discussed in class and our favourite at the moment, we play 'Can You Do Better?' I post a boring sentence on Edmodo and students need to used vivid, figurative language to enhance my original sentence. In essence, students are engaging with the curriculum outside the classroom doors and enjoying it! As a side note, you can set up Edmodo with your students on 'Read Only'. This greatly diminishes the social collaboration benefits. I'm sure you can tell that I am a fan of Edmodo, however there are pitfalls to avoid. Opening up a social media site for your students is a responsibility. Often I see teachers set it up and then leave students to their own devices, not moderating comments, not using it for educational purposes and when students are not given a purpose for digital technology, it is sure to be used in non-productive ways. Check out the links below for more information on Edmodo and its many uses in the classroom. One thing I almost forgot, it is allowing me to connect with education communities across the globe! My account for my students remains separate and private, however, I am connected to great pages such as Gamification of Education, ICT Teachers, Grade 5 Math, Digital Classrooms, the list goes on. Every time I log onto Edmodo, teachers are talking about something new and exciting. It is a quick way of keeping in touch with what is going on in the world and more specifically education. I need to stop now. 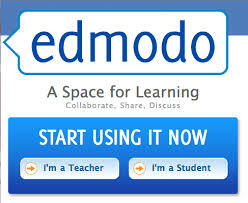 There are many websites, videos/ tutorials on how to use Edmodo in the classroom. Below I have added a few links and a couple of videos. I would love to hear from people using Edmodo in their classrooms. 7 Brilliant ways to use Edmodo that will blow your mind!